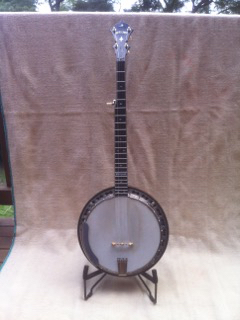 The Whitestar was the least expensive banjo produced by Geoff Stelling but had all the same hardware and finish work as the more expensive models. Tone rings, rims and flanges were the same for all models. The differences were mainly in the inlay patterns and timbers used. One owner since new. This is a real workhorse of a banjo and will not disappoint. Price: $2,750 or sensible near offer .